This Rocky Horror Picture show color palette was my favorite to put together for October’s movie-based theme. 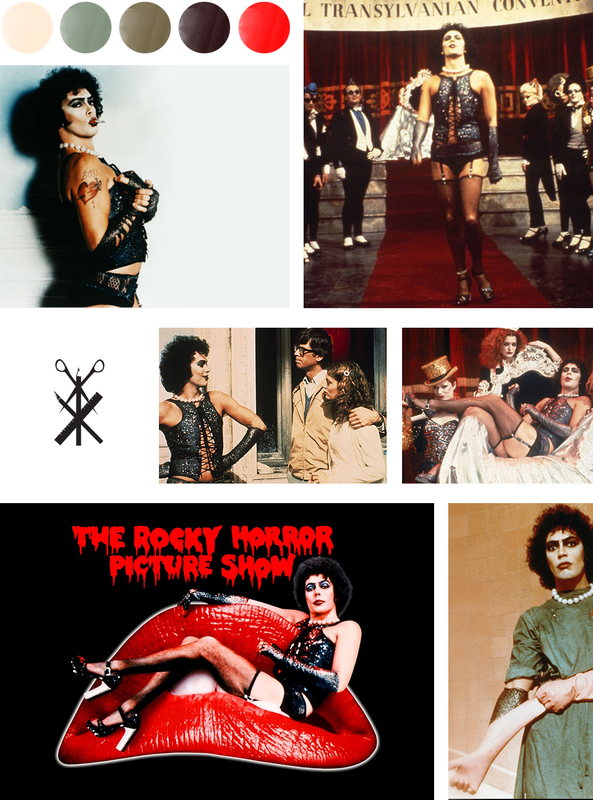 Rocky Horror Picture show and color palette creating go hand in hand. The movie was filmed with high contrast blacks and whites and not much else in the saturated color range except red, similar to the Addams Family. The 70’s vibe in this movie is strong and I love it. Everything is a little bit off-white and creamy and the reds are so deep you can feel the texture of the velvet in the auditorium. The space is something that would be shown in other movies as classically beautiful and elegant – so you have a lot of colors that are kind of basic. From there you get these awesome costumes and creepy moments where hits of bright red happen and it sets the movie off-kilter a bit. Love. It. Side note: I am considering being frank in the scene where he were’s the Dr. gear (see bottom right image) for halloween… thoughts? This movie is chalk full of costume and make-up inspo and it’s wonderfullllll.